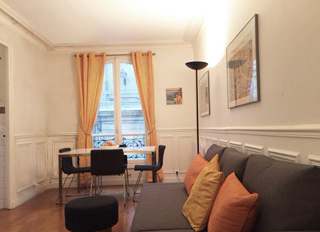 This apartment is 44 sq.m, on the first floor of a stone building on the Rue Cyrano de Bergerac, a quiet street with minimal traffic in the area of Montmartre. The area is typically Parisian, mostly built 1860-1900. 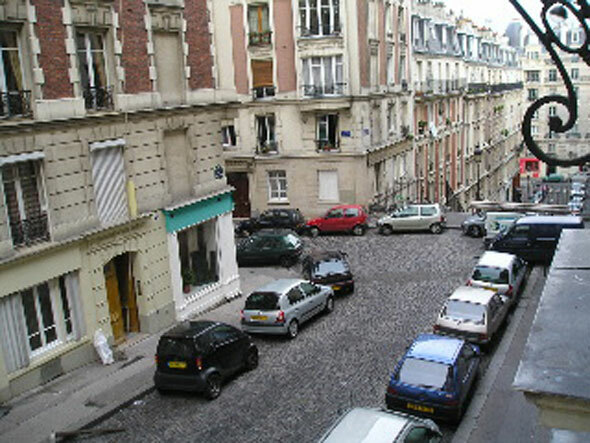 Rue Cyrano de Bergerac was named in 1897 to commemorate the opening of the celebrated play in that year. There are excellent food shops and several boulangeries quite close and a basic supermarket 100m down rue Francoeur. Boulangeries are traditionally closed on Monday, however, one on rue Caulaincourt is open on Mondays.The nearest Metro, Lamarck Caulaincourt is fairly level 5 minutes' walk (it has a lift as well as stairs since the metro line is quite a way underground). There is a boutique post office opposite the metro entry on rue Lamarck, food shops on rue Caulaincourt and rue Custine, which stay open reasonably late and 2 credit card machines on rue Caulaincourt. The building has Digicode entry, and a security tag for the foyer entry. 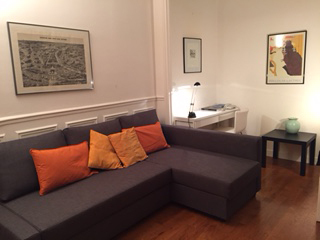 The apartment has deadlock key entry door.The closest Airport is Roissy Charles de Gaulle - 20 minutes by taxi. If arriving from Gare de Lyon, tell taxi driver 18th arrondisement, by rue Custine and into rue Francoeur. When taxi turns off Peripherique at Porte de Clignancourt (passing by the Stade de France) and travels along bvd Ornano, tell driver to take rue Hermel past the Mairie 18th & turn right into rue Custine & down rue Francoeur to the first corner which is rue Cyrano de Bergerac. The apartment is also close to Gare du Nord Paris Terminus for Eurostar London-Paris train (by metro if not much luggage, otherwise a small taxi ride - mention rue Custine and rue Francoeur). Metro Jules Joffrin is a short, downhill walk from the apartment opposite the Mairie on rue Ordener, and nearby the street market (closed Mondays) on rue Poteau. There is a credit card machine outside BNP on rue Ordener. Rental $1000 Aust per week (GST included), includes electricity. Please call Julius Bokor on 0419 258 432 for further information or reservation.